Good Friday morning everyone! Winter Weather Advisory remains in effect for parts of northern and eastern Kentucky this morning where light snow continues to fall. If you are traveling in the advisory area, use extra caution as area roadways could be hazardous. For areas not in the advisory area, a mix or rain and snow is possible throughout the morning, but as temperatures warm this morning everyone will change over to rain. Rain chances will be near 100% this morning before falling to around 40% by this afternoon. Sunday-Tuesday will feature a period of sunshine with temperatures in the upper 50s to lower 60s. On Wednesday a system will roll in and feature another shot at some severe weather along with a flooding threat. 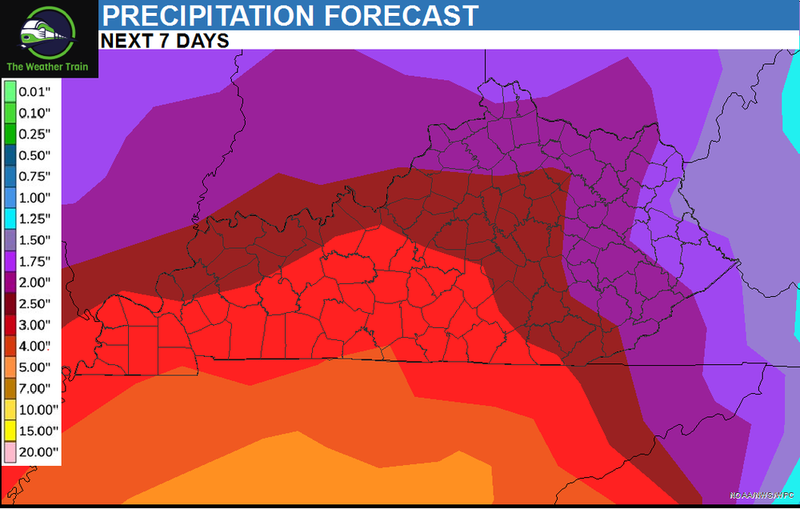 The latest precipitation forecast below is showing much of Central Kentucky picking up 2-3 inches of rain, but this forecast includes rainfall from today and tomorrow. I'll monitor both of these potentials firmly over the next several days.